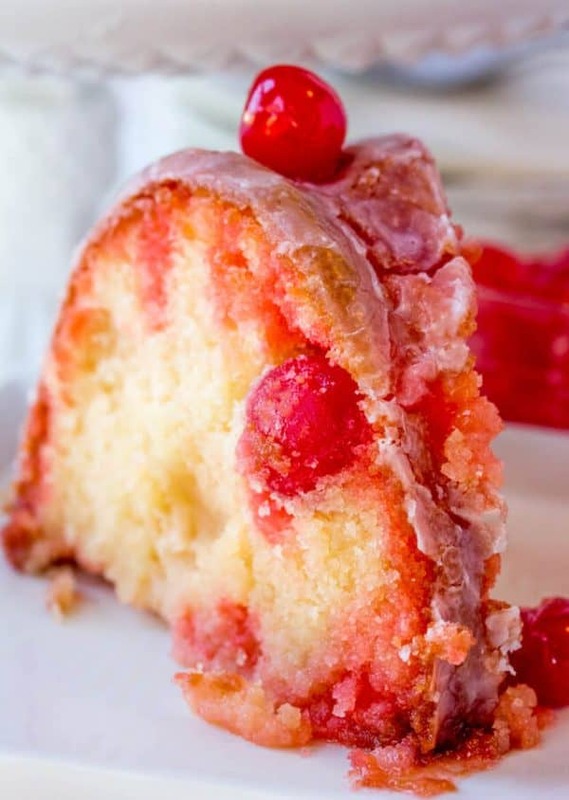 Fruity and moist this Shirley Temple Cake is a fun twist on a childhood favorite drink turned into a delicious dessert! Oops I did another cake. Sorry, not sorry! But you guys know how I can’t get over my cake addictions. But you guys, this Shirley Temple Cake has THE BEST flavor ever. Omg, I’m so addicted to this you have no idea. Well I’m sharing this recipe today over at my friend Julie’s blog Taste of Lizzy T and you can find all the yummy details and recipe HERE! Trust me, you won’t want to miss this one!! It calls for all purpose flour no mention of salt or baking powder or soda. Is this correct? or was it accidently left out? Hi Sue, it is correct. This does not use any of the ingredients you mentioned. It’s an old fashioned recipe and we’ve never used it and it had never needed any of those. It’s more or less a pound cake type of texture. Could you use a box cake mix ? I wouldn’t be cause the rations of mix per other I gradients aren’t the same but if you wanted you could maybe do a yellow cake mix and a can of pop because I know toucan make cake that way.